Even before Targeting Archery started up in 2014, some of our members had been helping set-up and run archery Have-a-Go stalls for events, fund-raisers and galas for a number of years. Targeting Archery has continued to run its own stalls at events since its inception and continues to do so now. So we are very experienced in site inspection, setting up and running a stall suitable for your event or gala. Archery is a very enjoyable sport and the sight of big round colourful bosses brings customers to the stall, each hoping to hit that centre spot. Friends and family members instantly become competitive and return time and again to try an better each other. 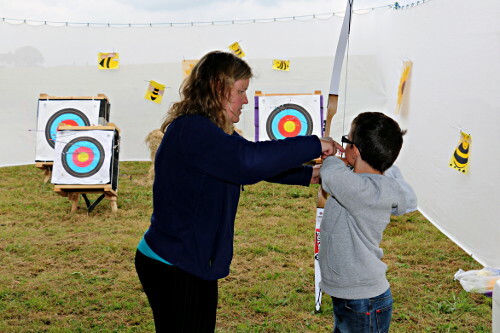 So an archery stall at your event is usually a winner and helps bring more customers through your entrance, bringing their pocket money with them too. We have standard round bosses but can also bring more interesting items such as fruit on top of poles and foam animals to shoot at plus hoops to try and shoot through. We also have several smaller plastic bows and sucker arrows for even the younger children to use. So if you are looking for an activity that will help bring in the public, you should consider contacting us to see if we can help make your event that bit more special. We will need to come and inspect your site checking things like access, site location, range orientation and of course all aspects of safety. So get in touch as far in advance as you can for all preparations to take place in time. Where required we can bring safety netting and poles which opens up the possibility of using more venues, as not everyone has open fields with no passers by to use for their events. We can discuss costs which may be a fixed amount for the session with free entry to the range, or we take an entrance fee per person. Other options are available and you should Contact Us to discuss this and all other aspects of running a stall for your event. We are more than happy to discuss various options with your organisers.